Lake Louise is consistently one of my favourite places to photograph elopements and weddings in the Canadian Rocky Mountains. 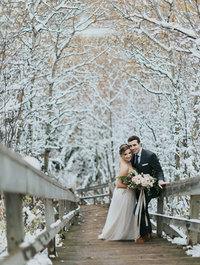 While it is tricky with all of the crowds, a little patience will yield spectacular Lake Louise Elopement photography results. Just ask Chelsea & Phil. 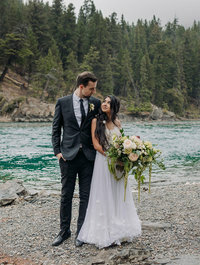 They traveled to Lake Louise from Florida with a small group of family for their wedding day. They had their ceremony at the upper Meadow at Fairmont Chateau Lake Louise. It’s a bit of a tricky spot to get to, especially for those wearing heels, but the short, steep run up the hill allows for photos with way less people in the background, which is really nice for an elopement ceremony. Chelsea approached the spot with her Dad and Phil’s reaction to seeing her is what most girls hope for… you could just feel the emotion!! Their ceremony was short and sweet (the best kind!) and we did some family photos right after before whisking the newlyweds away for portraits overlooking the iconic Lake Louise. Here’s where things get tricky. When you look at the photos, you think they managed to get this amazing place all to themselves. Not true. In fact, there were thousands of people roaming around the Lake when we did portraits, many of them stopping to take photos of the couple, some trying to selfie with them and some shooting right over my shoulder. So they definitely didn’t have the sot to themselves, but timing and patience made it look that way. After doing photos at Lake Louise, we headed to Moraine Lake, another iconic mountain destination that is packed with people, but you’d never know it from looking at the photos. Chelsea & Phil were a joy to photograph. 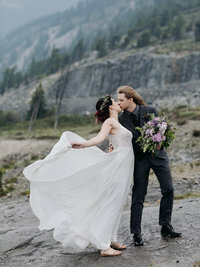 I’m so happy they chose me for their Lake Louise elopement photography. I’m so lucky I get to meet so many amazing people from all around around doing this job that I love. 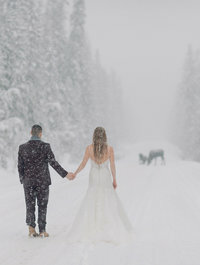 Are you planning to elope in the Canadian Rockies and want an amazing Lake Louise elopement photography experience? You’re in the right place! I adore elopements & intimated weddings in the mountains! To get more info, just use the contact form to get in touch to book your elopement or wedding package!